Shadow Power Harper Collins USA New York Times bestselling master of suspense Steve Martini returns, ensnaring defense attorney Paul Madriani in a web of terror and death being spun in the shadows of America's most sacred and secretive institution-the Supreme Court. A writer is savagely slain while on a publicity tour-a literary provocateur who craved headlines, but whose last book may have gone too far. His revelations about secret language buried in the U.S. Constitution-and hints about an explosive missing letter of Thomas Jefferson's-may be enough to cause an irreparable tear in the fabric of the nation . . . and perhaps drove a volatile youth to homicide. But Paul Madriani thinks a troubled young man with dark connections has been chosen as a scapegoat to cover up something far deadlier that festers in America's political heart. And in the wake of the strange disappearance of a Supreme Court judge, Madriani must survive long enough to find the devastating answers hidden in the shadow of power. 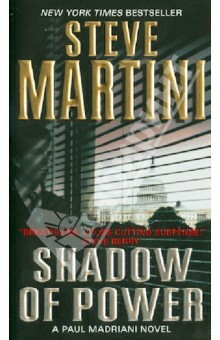 Аннотация к книге "Shadow Power"
New York Times bestselling master of suspense Steve Martini returns, ensnaring defense attorney Paul Madriani in a web of terror and death being spun in the shadows of America's most sacred and secretive institution-the Supreme Court. A writer is savagely slain while on a publicity tour-a literary provocateur who craved headlines, but whose last book may have gone too far. His revelations about secret language buried in the U.S. Constitution-and hints about an explosive missing letter of Thomas Jefferson's-may be enough to cause an irreparable tear in the fabric of the nation . . . and perhaps drove a volatile youth to homicide. But Paul Madriani thinks a troubled young man with dark connections has been chosen as a scapegoat to cover up something far deadlier that festers in America's political heart. And in the wake of the strange disappearance of a Supreme Court judge, Madriani must survive long enough to find the devastating answers hidden in the shadow of power. Издательство: Harper Collins USA, 2009 г.
Если вы обнаружили ошибку в описании книги "Shadow Power" (автор Steve Martini), пишите об этом в сообщении об ошибке. Спасибо!